Growing up, my siblings and I were what might be considered free-range. We had a lot of freedom to do what we wanted on our own. On any given summer day, I was off on my stingray bike for a full day of totally unsupervised adventure. Most of it was pretty benign but some of it involved some risky behavior. Fortunately, I emerged relatively unscathed and that freedom built nice layer of amount of self-reliance, something I value highly. But if we thought we were free-range, we were real pikers when you think about the Abernathy Boys from around the turn of the 20th century. They were two brothers born four years apart who lived in Frederick in southwest Oklahoma, a still relatively wild space at that time. Their range was much larger and freer than anything I imagined as a kid. Their father was a well known cowboy who had achieves notoriety as “catch-em’alive” Jack Abernathy for his ability to capture live wolves with only his hands. This feat drew the attention of Teddy Roosevelt, who came to Frederick in 1905 to see Abernathy perform the his unique skill. When Oklahoma achieved statehood in 1907 Roosevelt appointed Abernathy to be a U.S. Marshall. 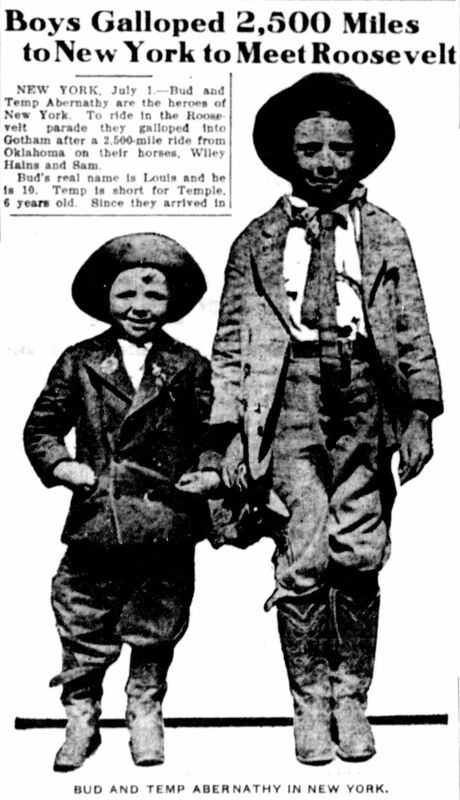 Jack’s sons, Louis “Bud” and Temple, had much of his panache. Their first adventure came in 1909 when Bud was 9 and Temple a mere 5 years old. The two mounted their horses and rode from Frederick to Santa Fe, New Mexico then back home again. Alone. It was a journey that covered more than 1400 miles and had them fording wild rivers and fending off wolves. The following year had them setting heir sights a little higher. Emboldened by reaching the much more mature ages of 10 and 6, they set off for New York City. Their journey captured the imagination of the country and was soon a national news story. Along the way, they met the Wright Brothers with Orville offering to give them a ride in his plane. Arriving in Washington, DC, President Taft welcomed them at the White House. From their they headed north to NYC where they met up with Teddy Roosevelt again. He was just returned from an overseas expedition and was given a ticker tape parade, which the boys took part in the parade, riding on their horses just behind Teddy’s car in the procession. When it was time to head home, the boys opted to ship their horses via the railroad and “bought” a Brush automobile to drive home. It’s believed that the Brush company gave the boys the car as part of a PR campaign based on the great attention they were receiving at the time. 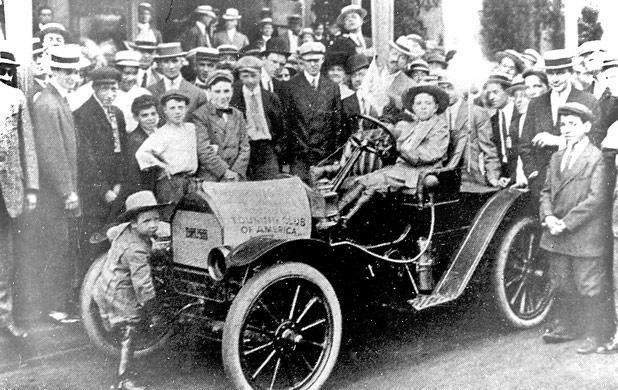 So they set off across country in their new Brush Automobile. Ages 10 and 6. 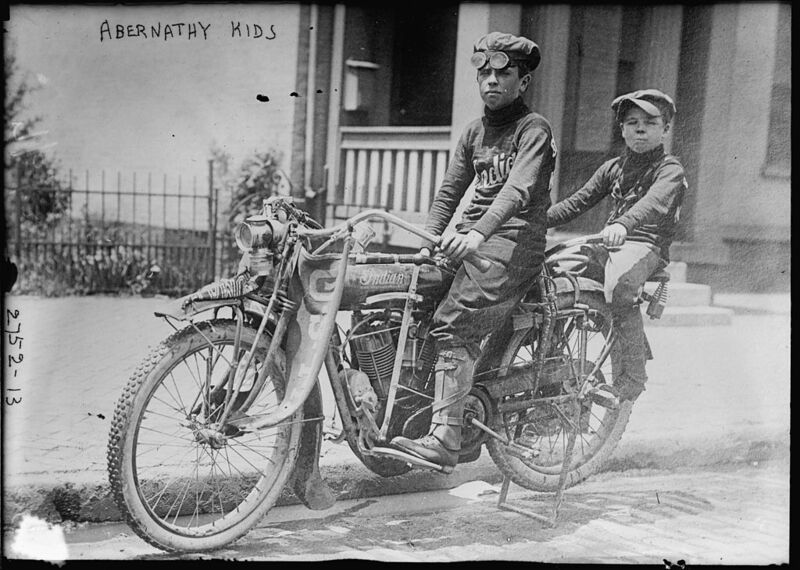 The idea of the 6 year old cranking that buggy alive seems like a steep task, but, hey, they were the Abernathy Boys. 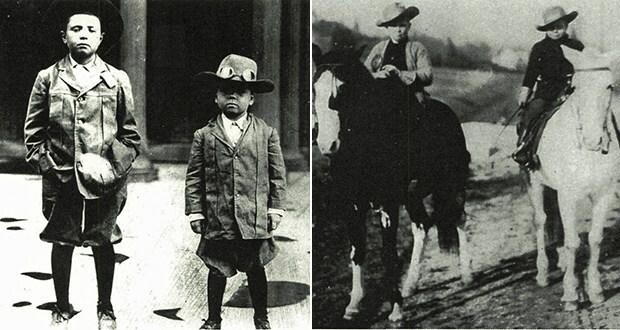 Two years later, in 1911, the Abernathy Boys were offered a challenge: If they could ride their horses from NYC to San Francisco in 60 days or less, they would receive $10,000. So at ages 11 and 7, they were off. It was a rough crossing but they made it. In 62 days. They didn’t get the cash but did set an equestrian record that still reportedly stands. Their final adventure, at least the last recorded, took place in 1913 when they were ages 13 and 9. They rode an Indian motorcycle (in the photo at the top of the page) from OK to NYC and back again. I can only think that it would be a long, tough ride for Temple on that little seat in the back. But, hey, when you’re 9 years old and accomplished all he had, it was probably a joyride. The Abernathy Boys went on to have successful lives, no doubt bolstered by their self-reliance and initiative. Bud went on to become a lawyer and Temple was an oil and gas man. Bud died in 1979 and Temple in 1986. Though their journey was relived in a few books and a film of the time and it is still celebrated in their hometown, it’s one of those stories that have faded over time. But it’s a great tale, one that probably could have only occurred at that place and at that time in history. Very evocative of the spirit of that age. I know we live in a different age, but the next time the kids go out to check the mail box alone, don’t feel the need to watch them from the window. Take it from the Abernathy Boys, most likely they will be okay.